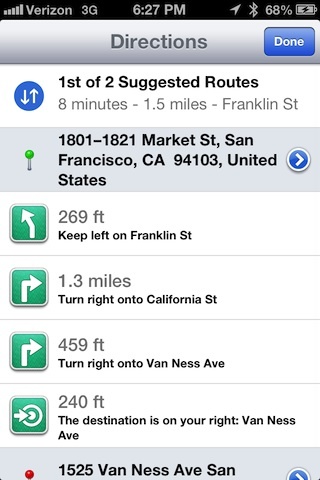 Apple's strategy of taking its Maps solo in iOS 6 was initially described in Apple wants to wipe Google off the map with iOS 6, while a second segment detailed how the company will be leveraging vector graphics to greatly improve the Maps experience in iOS and a third segment outlined how Apple is adding 3D Flyover features to displace Google's Street View. 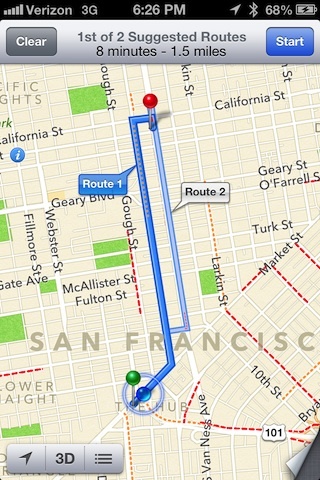 In the area of directions, Apple is similarly cutting Google out of its prime position as the exclusive source of iOS Maps directions. 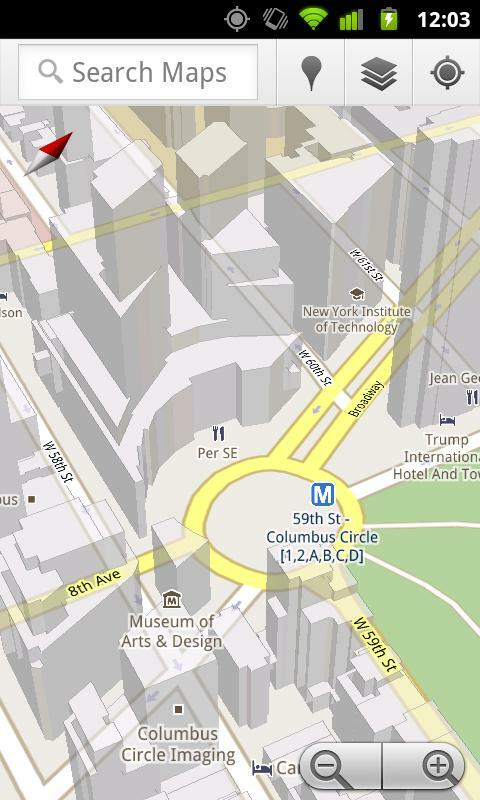 As noted previously, Google itself introduced the new Maps Navigation for Android 2.0 in 2009, with a series of new mapping features including voice prompted, turn-by-turn navigation features; voice search; searching for items along a plotted route and 3D models (below). 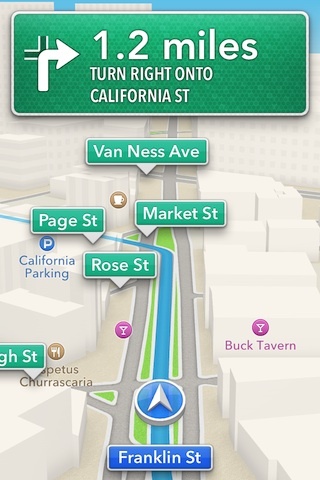 Apple initially appeared set to adopt those features as it had with Street View in the previous year. In late 2009, a Google spokesperson told AppleInsider, "Apple is a close partner. 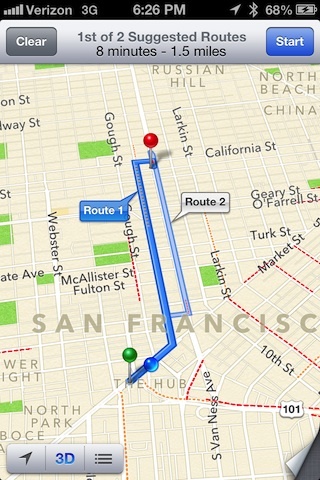 Millions of users experience Google Maps on the iPhone. We will continue to work with Apple to bring innovation, including Latitude and Navigation, to users but you'll have to speak to Apple about availability." 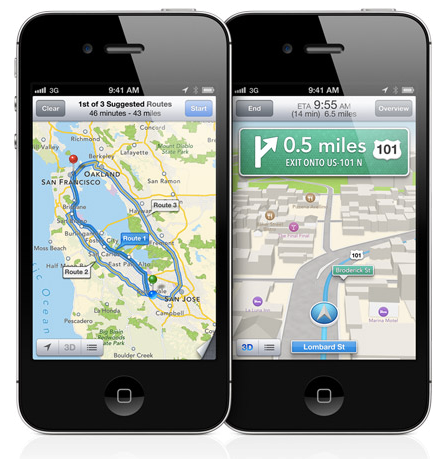 However, Apple never added Google's Navigation features to its own iOS Maps client, instead shunning them along with Google Latitude, Places, 3D models and subsequent other map enhancements that Google hoped Apple would spread across its iOS user base. Instead, though a series of acquisitions and partnerships, Apple built a complete in-house replacement for Google's maps and all of its related services. For driving and walking directions, Apple appears to be drawing information from GPS and map provider TomTom, which itself includes a long list of regionally-specific licensing deals under iOS 6 Map's acknowledgments. 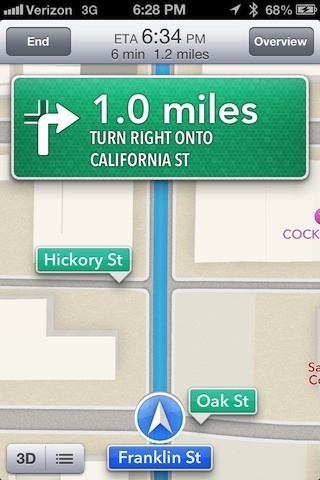 When you perform a request for driving directions, Apple presents a few alternative paths to choose from, just as it does in the current maps. You can explore this selection of driving routes, freely panning around, rotating the map or entering 3D mode to compare each of the suggested paths. 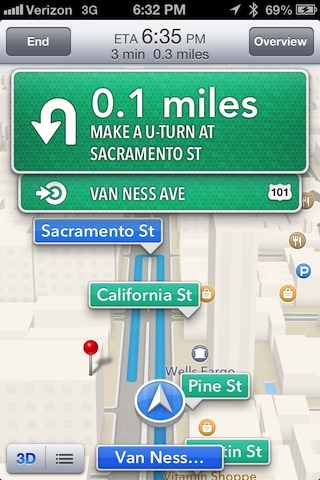 Once you select a given route and click Start, Maps jumps into its turn-by-turn mode, with the voice of Siri audibly guiding you along the path. You can at any point toggle between 2D and 3D views (shown below). Nearby road names are called out in large "street sign" banners, reducing the need to zoom in or look in detail at the map while plotting a course in your car. 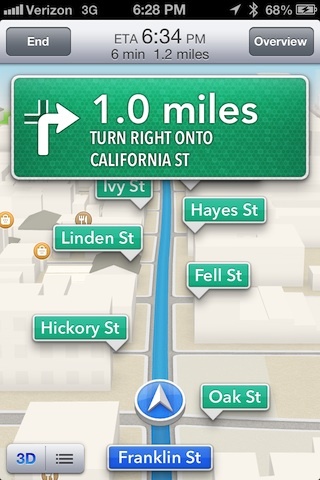 Ideally, you would follow the path via Siri's voice rather than watching the screen, something that the new Maps finally makes possible (and which Google has supplied for Android since 2009). 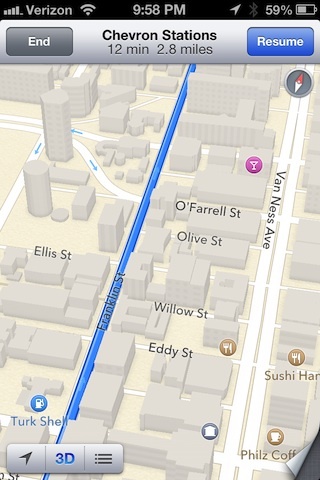 Once in turn-by-turn mode, you can't arbitrarily pan around or rotate the map because the view is updated dynamically as you move along your route, following the GPS. You can zoom in and out, but not very much. This means that once you start, if you want to preview an upcoming segment on the path, you either have to zoom out enough to see it (and the zoomed out view is limited to showing only a roughly four to six block radius) or switch to the Overview mode (below left, which supports the same free exploration of the 2D or 3D map, along or outside of your route) or Route Overview (below right, which provides a descriptive listing of turns). 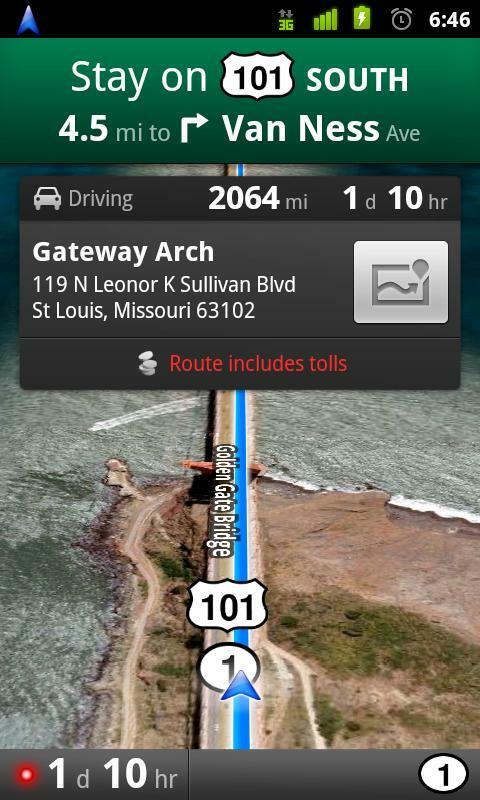 You can exit the Maps app while a path is being navigated; when you do, iOS provides a green "touch to return to Navigation" banner, similar to a phone call, voice recording or other background task.